Dakota: Manifesting a Monkey Chandelier Due to the proliferation of comment spam, I�ve had to close comments on this entry. If you would like to leave comment, please use one of my recent entries. Thank you and sorry for any inconvience caused. My mother left me a little money when she died in January. Rather than being a good sport and dumping my inheritance into the common pool, where I would be able to visit it once a year, and admire the interest it has earned, I had the idea that I could buy a room of my own-- a studio- a healing place-- in which I could loll around on the material plane, so I set about manifesting one. Esther Hicks, channeling Abraham always recommends that one take an emotional journey before one takes an action journey. With that in mind, I got myself really excited about having this little place in the city. Sometimes I imagined a sunny balcony, a roof garden , or a deck, then there was the fireplace and the off street parking space. I have been savoring the fantasy since January. As Esther Hicks points out, you don't have to dust a fantasy, which is one of the reasons for making the process of manifestation last a long time. In fact you might enjoy the process so much, you may never have to have the real thing. When I shared this idea with my dear friends , they all got excited with me. One of them knew a wonderful real estate agent with a Ph.D. in English who is scrupulously honest and has great taste . When I called him he was just leaving his office that minute for a three week sojourn to India. I was happy to wait. We got in touch a day after he returned, and he called me back with something that had just come on the market minutes before. It was priced to sell. I went to see it that afternoon. There was a tree with red berries in front, which I took as a sign. Why not?. In spite of the fact that this was the first property I had seen, and I knew better, I made a formal offer on it the next day. As it turned out, someone else made an offer slightly higher than mine -- the beginning of a bidding war. I decided not to participate. Although the place was adorable, I needed a bit more space. 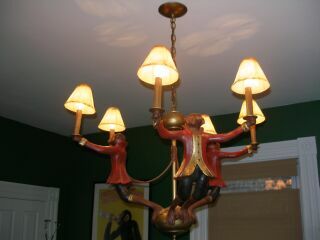 Besides, the monkey chandelier was specifically excluded from the sale. It was a studio - a room 13x14 with a bay window facing the street, painted forest green with white woodwork - (the tiny modern kitchen in back was periwinkle, and the frig full of beer). The room was almost completely taken up by a covered pool table. 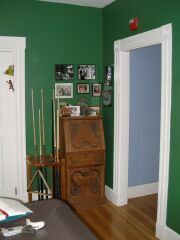 There were two upholstered chairs, a bar, a Larkin desk with a cue rack, and a stethoscope hanging on the closet door. There were matches and printed napkins lying around with the name "Monkey Bar" printed on them. The Chinese rug beneath the pool table had a tropical theme, and there were monkeys rollicking everywhere in posters, figurines, and masks, including three, holding lamps on the chandelier. It had deeded off street parking for two cars in tandem and a basement storage space which in a pinch, could have been gussied up for other purposes. It was directly across from the smarmiest bakery in town, and a grocery/cafe combo store, just in case refueling was ever necessary. The bus stopped right around the corner. What WAS this place used for, pray tell? A private men's pool club? It definitely had a mildly illicit flavor. And why were they so eager to get rid of it? An indulgence that proved too costly? That's that. I'm not sorry I passed it up, given that it wasn't quite large enough for my purposes, whatever thay may be. Close , but no cigar, as they say in the billiard room. I hope this entry and it's dark photos aren't too much like a bad real estate ad. I did want to share my first manifestation attempt, since I'm likely to be working on this project for awhile. Addendum: Davi Small at Sisal Lighting wrote to say that they have monkey chandliers for sale, should you be casting around for one yourself.